The best thing about Swedish movies is the language. I find it very fascinating and enjoyable to listen to, the accent & the cadence, a way of speaking that feels so ancient, like a remnant of medieval times. I’m no linguist and I understand that different languages have been alive in different parts of the world for thousands of years, but for some reason hearing Swedish spoken transports me back into history, to the time of the Viking, to the Dark Ages. And maybe it’s the bearded men that help with the illusion, but something about it always captures my attention and forces me to listen. 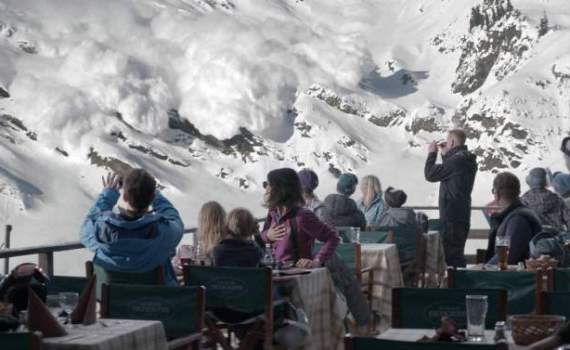 In Force Majeure, Swedish is just once language spoken, along with a good deal of English and a smattering of French, making for a movie that goes beyond country of origin, that becomes a story about humanity in general. But still, I can’t deny the power of the dialect, a sound that drew me in to the power of the film itself. On vacation in the Alps, a family of Swedes settle down for a relaxing stay at a nice hotel, where skiing, eating, and napping will be there routine. Tomas, the father, has been very busy at work lately, leaving Ebba, his wife, to take care of the children, Vera & Harry. This trip will do everyone good, as long as Tomas can put down his phone, and will help the family to reunite in a way that seems desperately needed, not just desired. But one event, one random occurrence, will shake their pleasant holiday and might even tear apart the fabric of their bonds. While out to lunch on the resort balcony overlooking the picturesque mountains, a controlled avalanche begins, rumbling nearby. As it quickly gathers speed and ferocity, control seems lost, and the patrons of the restaurant scramble to get out of the avalanche’s path. What happens next, what Tomas does in a moment of panic, will affect the rest of the trip, the rest of their lives, and may change everything. I have to be purposefully vague in the summary as to not give away the events of the film. Not that there’s a huge possible spoiler or a crafty plot twist, but you need to be surprised by what happens, need to judge it for yourself. And that’s what Force Majeure becomes about; judging a troubling situation for yourself and deciding where blame should lay. Or deciding that no one is to blame at all; the choice it yours and that’s what makes this movie great. It’s a mind-bender, not with tricks, but with simple questions, presenting drama to the audience and then asking the audience to decide what’s right, what they themselves would do in extreme moments. And it takes some fine acting to pull off such a simple & realistic plot, to allow so much to be spoken with so little said, and the actors here all delivered expertly. It’s a movie that takes time to sort out, that challenges us to think, that takes the edge off with a little humor, but never backs away from the difficult questions, even when we might need a break. Force Majeure should be up for Best Foreign Language Film at the Oscars, and just might deserve the win.